Sticky note outliner and to-do's. Is there a better alternative to TaskCard? Is TaskCard really the best app in Personal Info Managers category? Will TaskCard work good on macOS 10.13.4? 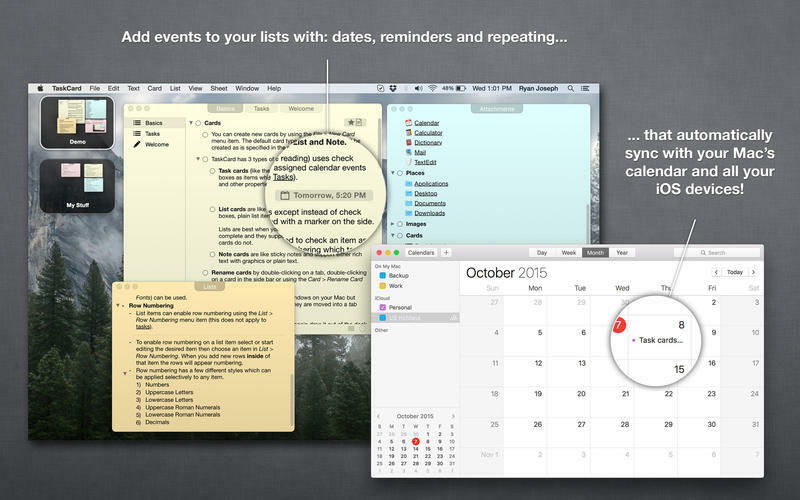 TaskCard for Mac is a nimble and easy-to-use yet deceptively powerful app for taking notes, designing outlines, and organizing projects. It gives you a dedicated workplace where you can organize all your ideas, keep your notes, and plan anything you want. 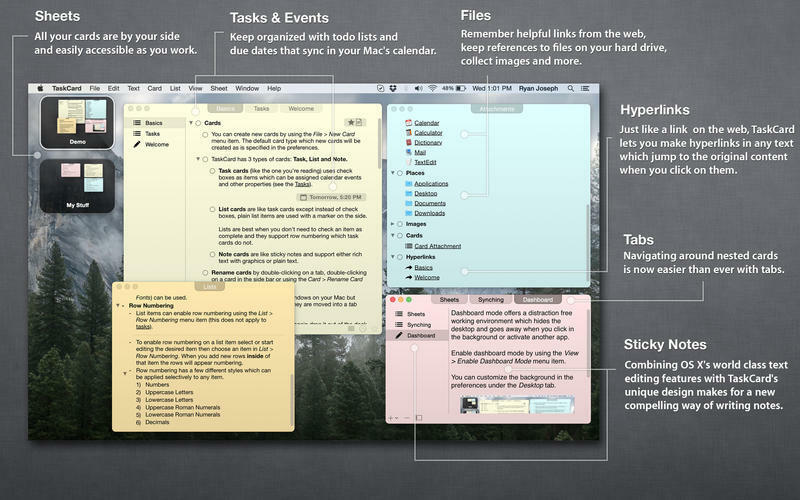 TaskCard was designed from the ground up to be a totally unique experience on the Mac, while taking full advantage of the latest features OS X has to offer. Professionals, students, and casual writers alike will appreciate TaskCard's unique approach to working with ideas, while benefiting from it's powerful feature set. Fixed: Dashboard mode bug in 10.13 High Sierra when switching apps. Fixed: Dragging root card onto itself is no longer possible (which would cause a crash in previous versions). New: For users with multiple displays cards now save their position independently for each display. New: Copying and pasting files inserts them as hyperlinks that open the file in the Finder instead of displaying a document icon like before. Fixed: Paste and always match style maintains style after typing (oops! ).